South Seoul Plaza Hotel (former Crown Plaza Hotel) is located in SinJeju, the convenient place to access tourist attractions and the hotel offers a cozy hotel life with a variety of facilities and room equipments. The hotel also runs a casino for foreigners. Even more, the hotel is only 5min away from Jeju Inte’l Airport so the location of the hotel is perfect for busy business travelers and sightseeing travelers. 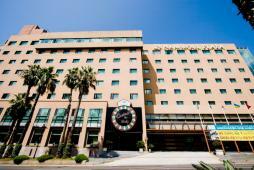 The hotel is only 20 to 30 min away from major tourist attractions. The hotel boasts 224 guestrooms with a wide selection of standard room with soft colored interior, suite and royal suite, luxurious suite room. The hotel also emphasized on room facilities and all rooms are equipped with a computer with broadband internet connection.